Canaletto was an excellent draftsman. After himself, he left a huge number of drawings, ranging from instant, made in the street, sketches and ending with copies of his own paintings, filled with pen and ink. Stored in the Venetian Academy pocket album reveals to us the creative method of Canaletto. An analysis of the surviving sketches of Canaletto’s paintings shows that when he started a large canvas, he worked, first of all, with the drawings collected in the album, changing angles and creating, thus, his own original perspective. Finished drawings Canaletto, made with a pen and black or brown ink, are considered to be small masterpieces of the artist. 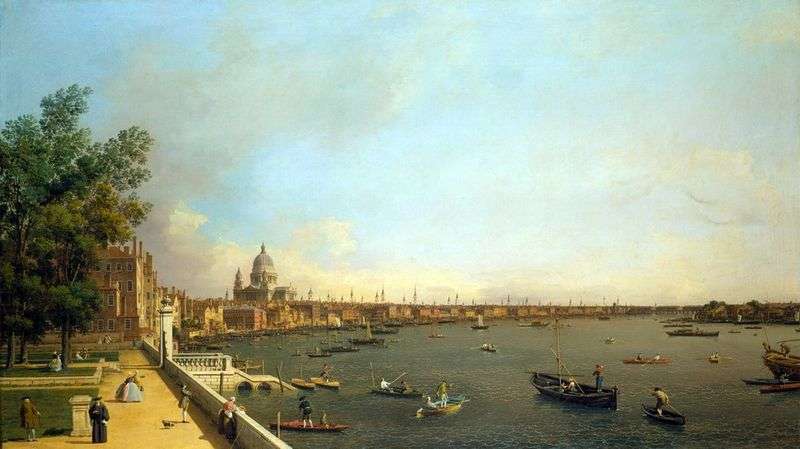 One such masterpiece is “View of the Thames and London from Somersethaus.” Such things Canaletto are distinguished by a free line and liveliness. Over the years, the once sharp, energetic stroke of the drawing softened; the Canaletto line became smooth. Description and meaning of the painting View of the Thames and London from Somersethaus by Antonio Canaletto.